Purana Pul (English old bridge), built in 1578 AD, Hyderabad, India. built over the river Musi. 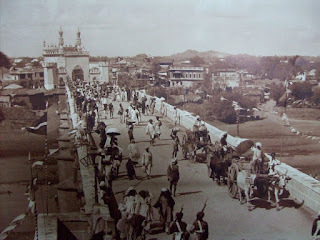 It is the first bridge ever constructed in Hyderabad and among oldest in South India. It was built during the reign of Qutb Shahi dynasty, for quick travel between Golconda and Hyderabad.It was the entry bridge into the capital of Hyderabad state.The bridge is now defunct, and is used as a flea market. It is cherished as one of the oldest landmarks of Hyderabad. old stories write, Prince Muhammad Quli Qutb Shah was in love with Bhagmati, a Hindu girl who lived on the other side of river Musi. His father Sultan Ibrahim Quli Qutub Shah decided to build the bridge so that his son could cross over the river safely. However, the fact is that when the bridge was being constructed, young prince had not even reached puberty and the lovestory of Quli Qutub Shah had started after being throned. Actually the bridge is assumed to have been constructed to facilitate the travellers coming to Golkonda for diamond and pearls trade. The bridge has 22 arches and is 600 feet long and 35 feet broad and 54 feet above the river bed. The bridge was also built out of Sultan Ibrahim Quli Qutub Shah concern for his people and so the bridge was always known as a symbol of love – of a father for his son, of a prince for his beloved, of a monarch for his people. There is an old mosque called as Mian Mishk Masjid close to Purana pul. he bridge is 600 feet long, 35 feet broad and 54 feet above the river bed based on 22 arches.